The Revenue Department is letting individual taxpayers claim an income tax deduction for prenatal care and childbirth expenses of up to 60,000 baht per tax year, with retroactive effect from Jan 1 this year, according to a department announcement. 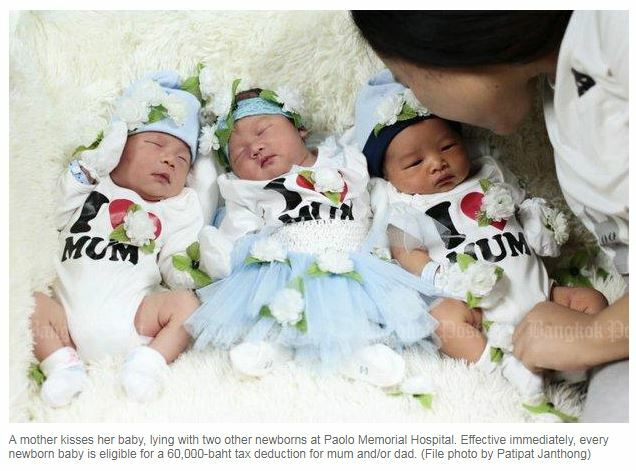 The new tax deduction is aimed at encouraging people to have more children as Thai society ages. The announcement states that prenatal care and childbirth expenses include healthcare costs incurred from pregnancy and giving birth (such as drugs), as well as medical, childbirth and admission costs, regardless as to whether the baby is born alive. A taxpayer who is pregnant and her spouse can claim expenses related to prenatal care and childbirth costs not exceeding 60,000 baht in each tax year. For single taxpayers, either the wife or husband who earns income can claim a tax deduction for prenatal care and childbirth expenses of up to 60,000 baht per tax year, while joint filers can also deduct up to 60,000 baht. For couples filing separate tax returns, the wife can claim a tax deduction of as much as 60,000 baht per tax year. The tax-collecting agency earlier abolished the previous cap on the child allowance, which was limited to three biological or adopted children, starting from the 2017 tax year. The allowance per child was also doubled to 30,000 baht to help boost the country’s birth rate. According to Fiscal Policy Office estimates, the percentage of Thais aged 60 and over is expected to increase from 14% of the population now to 17.5% in 2020, 21.2% in 2025 and 25.2% in 2030. Thailand is an ageing society as defined by the UN and will become an aged society by 2025. A society is considered ageing when one-tenth of its population is over the age of 60, and aged when one-fifth is over 60. The country was earlier recognised by the World Bank and the International Monetary Fund for its achievements regarding birth control, but now the country is facing a labour shortage, with local operators relying on migrant workers. Southeast Asia’s second-largest economy experienced a baby boom during 1963-83, when more than 1 million children were born each year. But the birth rate has dropped below 800,000 a year, with the fertility rate down to 1.62 children per woman in 2010 from five children in 1974. The fertility rate is forecast to fall further to 1.3 in 2040. Children aged below 15 accounted for 17.3% of the population last year, and the ratio is expected to decline to 16.8% next year and 15.2% by 2027. Reversing the demographic trend is on Prime Minister Prayut Chan-o-cha’s to-do list. Apart from tax deductions, the government is providing a 600-baht monthly welfare benefit for newborn babies until the age of three, up from 50 baht in the past, while the Social Security Fund recently raised the baby bonus paid from birth to six years to 600 baht a month from 400.